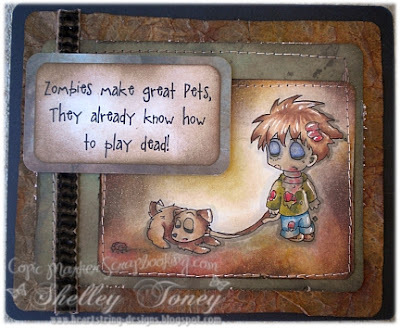 Over at Copic Marker Scrapbooking the Zombies have invaded. Yes, that's right. The latest line of stamps for sale there are all about the Zombie Invasion. 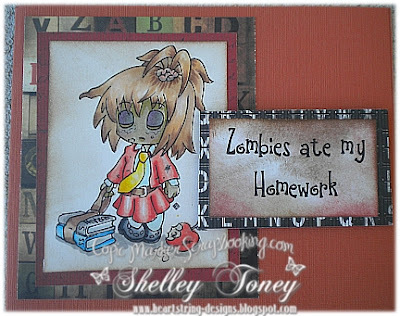 Today at their blog they are showcasing my preview of that fun digi stamps. And this is my version of another that was released last week. There will be more Zombies popping up here and there in coming weeks. Kinda fun, huh? The sewing and inking on these cards is fantastic! The zombies are just hilarous! Love it! lol I think Jeremy is in on the whole Zombie Apocalypse thing. I showed these to him, and he really liked them. Very clever.